With over 11 years of experience in entrepreneurship, management, operations, and decision analysis, Shefali has the breadth and depth of experience needed to quickly understand businesses requirement and expertise in building team for crafting the most suitable solutions. Shefali has also worked with Satyam Computers for 2 years in .NET Technology. As Assistant Vice President of Aritone, she manages the HR, Operations and Business Development team. 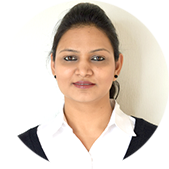 She is also managing operations and client delivery at JobGully. Being associated with JobGully and its parent company “Aritone Global Ventures Limited” in several ways, her contribution in the success of this organization has been remarkable. Contact us for your business enquiry online. Our team will get back to you. “Code Platter Softwares Limited has been working with us for well over two years and we are satisfied with their performance, professionalism and sense of ownership throughout the projects. We look forward to continue using services of Code Platter and take this opportunity to congratulate Mr. Arihant for his excellent efforts. Copyright © 2018 Codeplatter. All Rights Reserved.